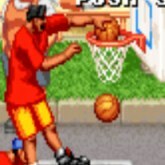 Description: Street Hoop is an awesome Neo Geo Arcade Basketball game very similar to NBA Jam. Choose from 3 player teams across 10 cities in the united states. The music and graphics are pretty funky lol. This game even has a Basketball charge meter that becomes full when you are scoring a lot and playing good. When charge meter is full you can perform a special on fire dunk or shot. It's pretty cool. Really fun one to play 2 players, to do so make sure you set custom controls for player 2 in the in-game controls menu.